Creatine (4g) – Each serving will provide you four different types of Creatine, including Creatine Monohydrate which is the most researched and purest form. Creatine has been scientifically proven to improve performance during short-term, high-intensity, repeated exercise bouts such as sprinting and weightlifting*. Caffeine (400mg) – MYPRE combines a proprietary blend of caffeine and guarana extract to provide 400mg of caffeine (equivalent to 5 ½ small cappuccinos). Caffeine has been shown to increase alertness and attention across multiple sports*. Amino Acids – 4g of Branch Chain Amino Acids (BCAA’s) in a 2:1:1 ratio of Leucine, Isoleucine and Valine. Furthermore, we have added 800mg of Leucine and a comprehensive profile of all the essential amino acids. Vitamins and minerals – Each serving provides Pantothenic Acid, Vitamin B6, B12, Niacin and Riboflavin which contributes to the reduction of tiredness and fatigue*. Pantothenic Acid and Biotin also contributes to normal psychological function*. Flavours – Available in 7 tantalising flavours which include; Sour Apple, Lemon and Lime, Watermelon, Raspberry Lemonade, Orange, Grape and Blue Raspberry. Additional ingredients - 3g of Beta Alanine, L-Citrulline Malate, L-Arginine, D Aspartic Acid, and Betaine. MYPRE delivers a host of ingredients to help improve performance, reduce fatigue and provide continual focus throughout your training. it is available in 7 tantalising flavours which include; sour apple, MYPRE and lime, watermelon, raspberry lemonade, orange, grape and blue raspberry. mypre provides a number of key ingredients which synergistically work together to improve performance. 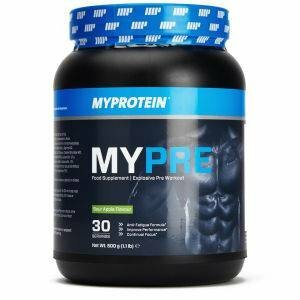 MYPRE is recommended for anyone looking for an explosive pre workout formula to improve performance, reduce fatigue and increase alertness and focus prior to your training. Ahead of the curve in innovation and taste, MYPRE was designed for anyone looking for a boost of energy and focus to provide that cutting edge to your workouts. MYPRE delivers a host of the most popular and researched ingredients to help improve performance*, reduce fatigue* and provide continual focus throughout your training so you should have no problem squeezing out that last rep or running that extra mile.